Our creative process is always evolving and improving. 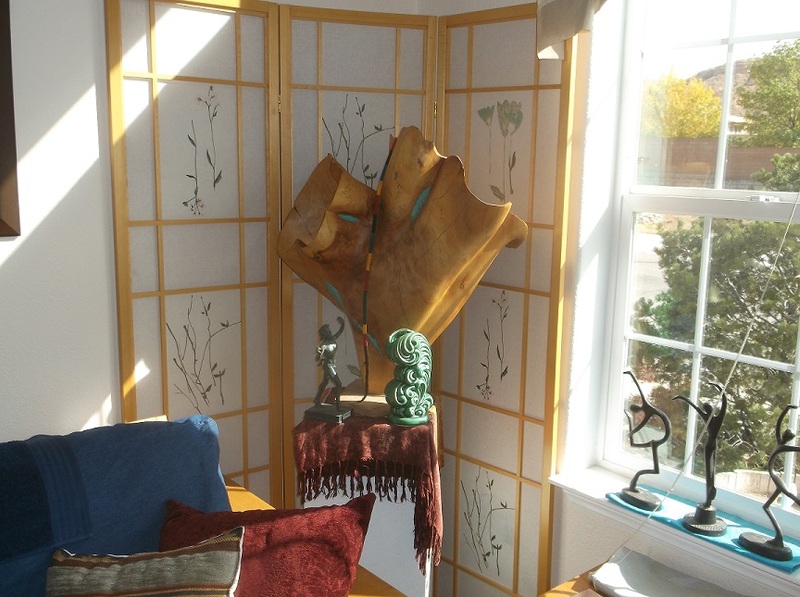 Recently we created new wall sculptures to add to the carved vessels and sculptures. The ideas keep flowing from Scott’s creative mind and he never ceases to surprise me. 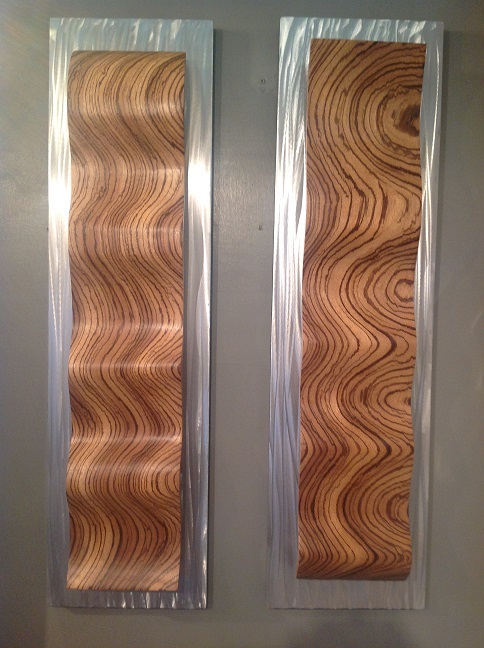 He recently changed out the wood backers on the wall sculptures with aluminum. A grinder was used to add lines and swirls to the aluminum to give it texture. The contrast between the wood and the aluminum really makes them pop and gives a more contemporary look. Already they are getting a lot of attention, in just one day. Currently they are on display at the 10 week show, Celebration of Fine Art, in Scottsdale, AZ. The show has four more weeks and ends on March 29th. 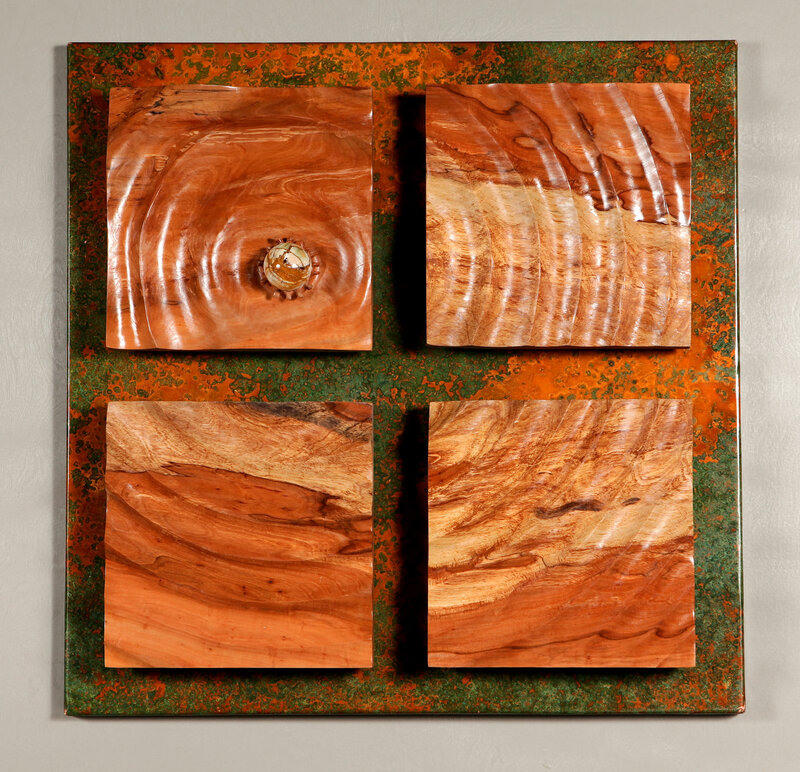 Other wall sculptures that we recently created have patina copper backers. They are also very unique in that they also include other materials. This first one was carved from Apple wood. It features an Onyx ball that sends ripples out from the splash it created. 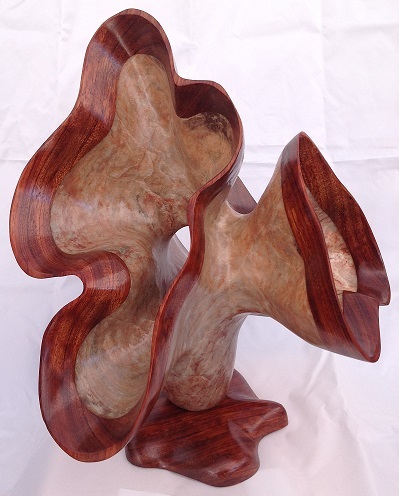 Gentle ripples in various sizes were carved to create this sculpture and achieve the look. The green in the patina copper brings out the green in the onyx ball and the apple wood and makes it pop. 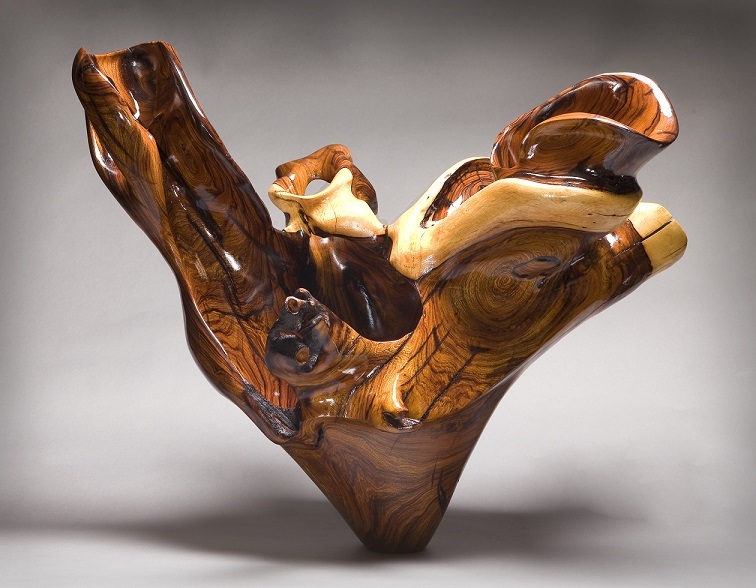 This next wall sculpture was carved from cherry wood. 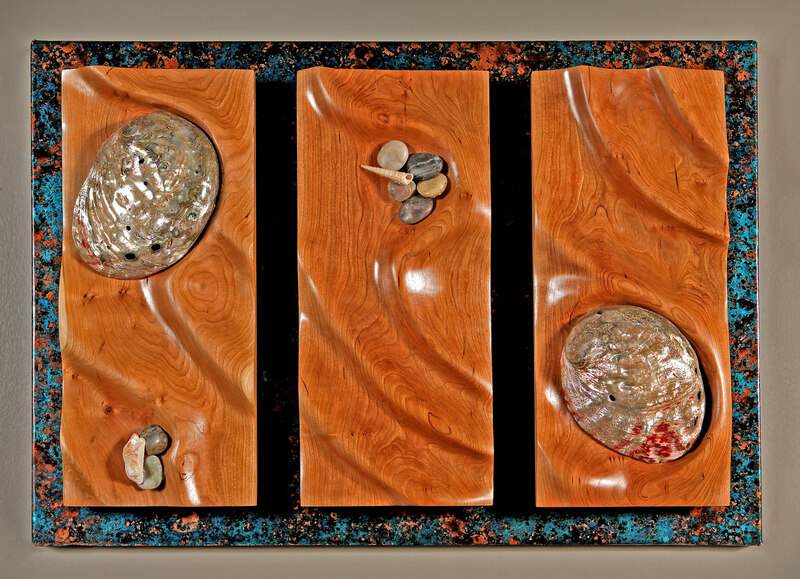 Abalone shell, along with other sea shells and rocks were added to the piece. 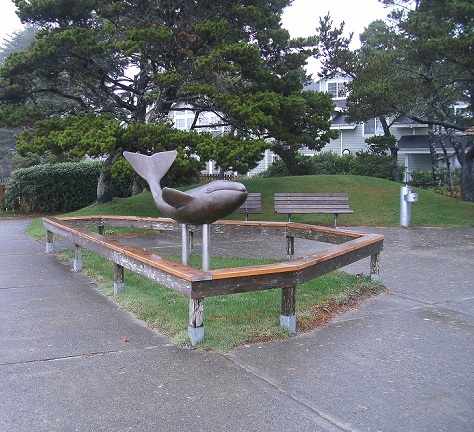 Waves were carved around these pieces, creating a tide pool effect. 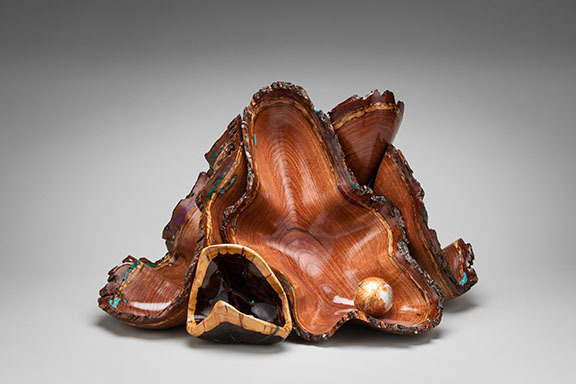 The blue patina copper makes the colors in the abalone shell stand out and adds color to the sculpture. This next wall piece is a unique collaboration between Scott and another artist, Kathleen Hope. 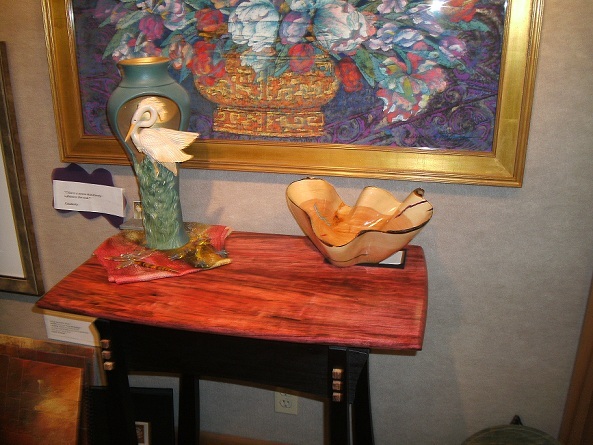 Her work in mixed media, mostly cement adds a completely different element to our carved wood. The vibrant blue and the white parchment are a beautiful contrast with the carved walnut. Another collaboration Scott did was with artist, Whitney Peckman. Her incredible embellished guard art was a great fit with our work. 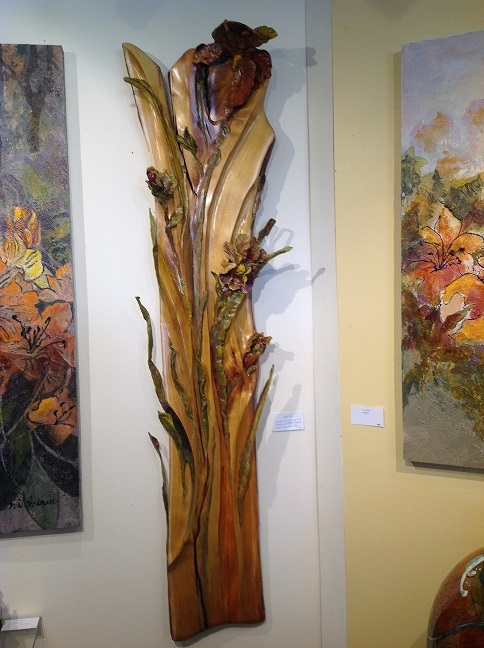 Scott carved on a piece of Osage Orange wood and Whitney created beautiful yellow Iris’s and leaves on it. This piece has a 3D look, giving the wall sculpture life. This year has been a year for bigger orders for us. 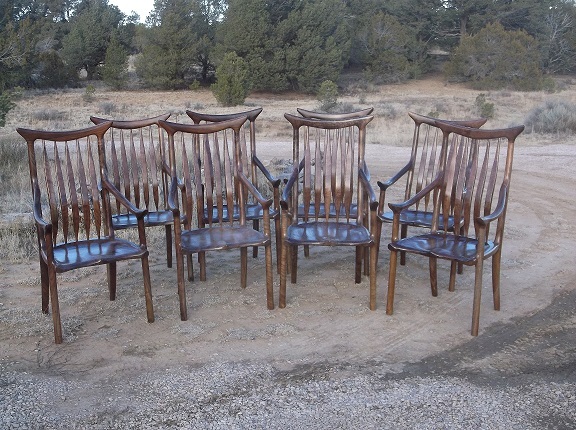 After arriving home from our 3 month adventure at Celebration of Fine Art in April, we took off on an order for 12 Greek God chairs and 2 Shangrila II rockers. 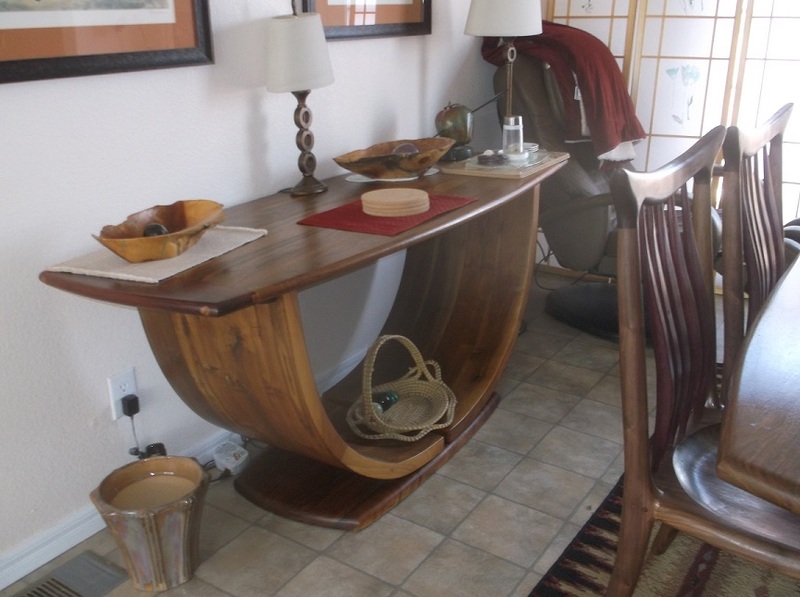 All were made from gorgeous black walnut. This order went to a beautiful new home in Midland TX. 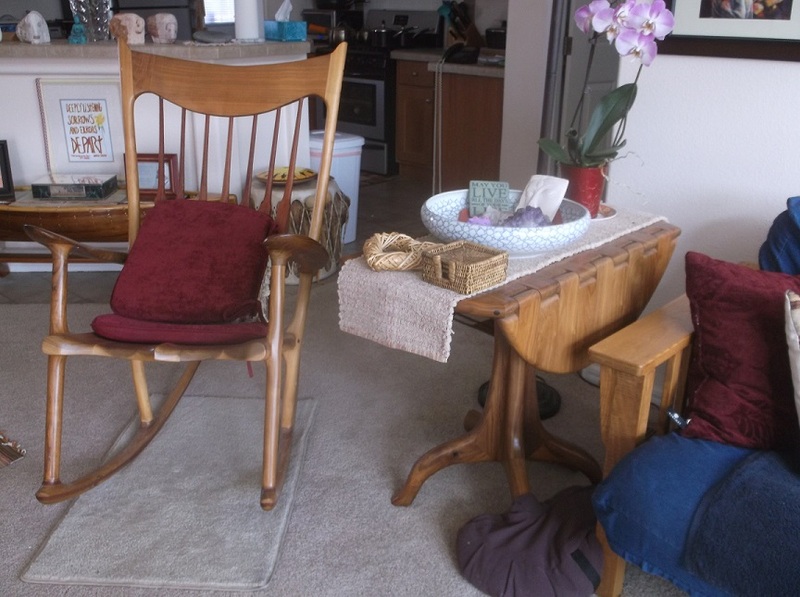 Here are some magazine quality photos the customer sent of all the chairs around their two tables and one of the rockers. 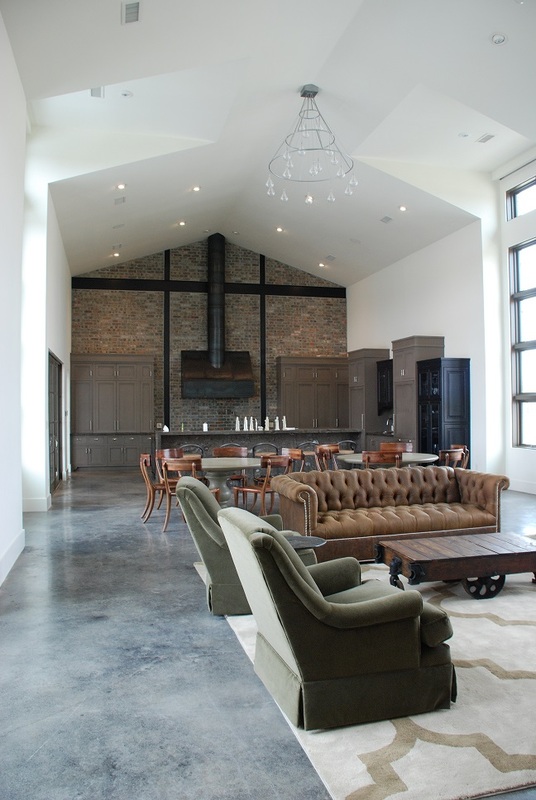 We feel honored to have our chairs in this Texas sized home that is so lovingly decorated by its owners Matt and Kristina. 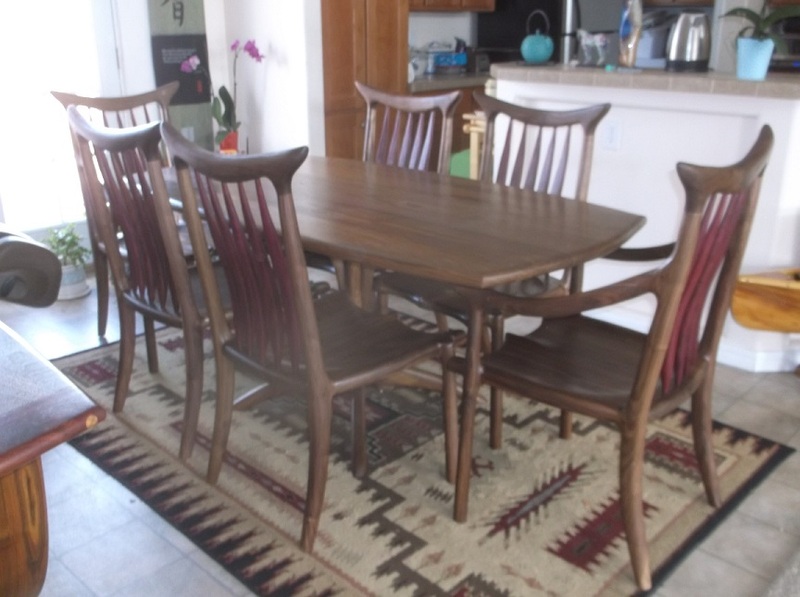 This shot shows all 12 chairs around their two round tables. I love those gorgeous doors in the background. 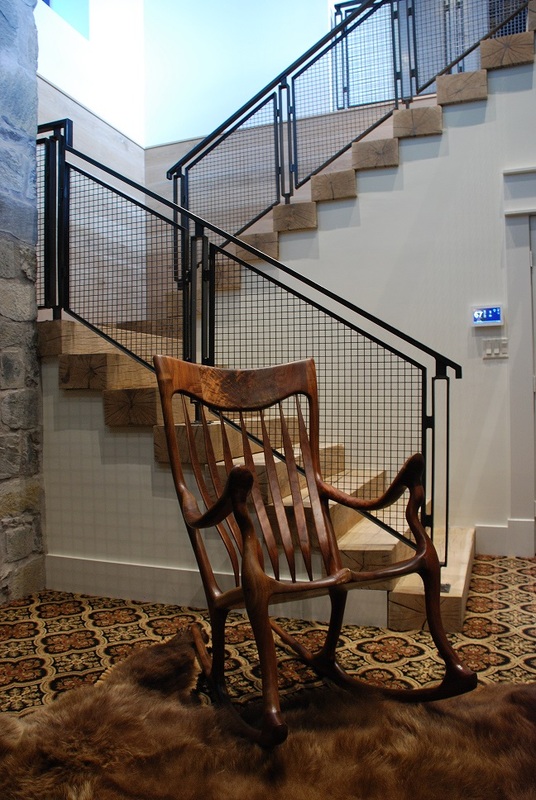 Here is one of the rockers downstairs. I love the rug underneath and the backdrop of the stairs. 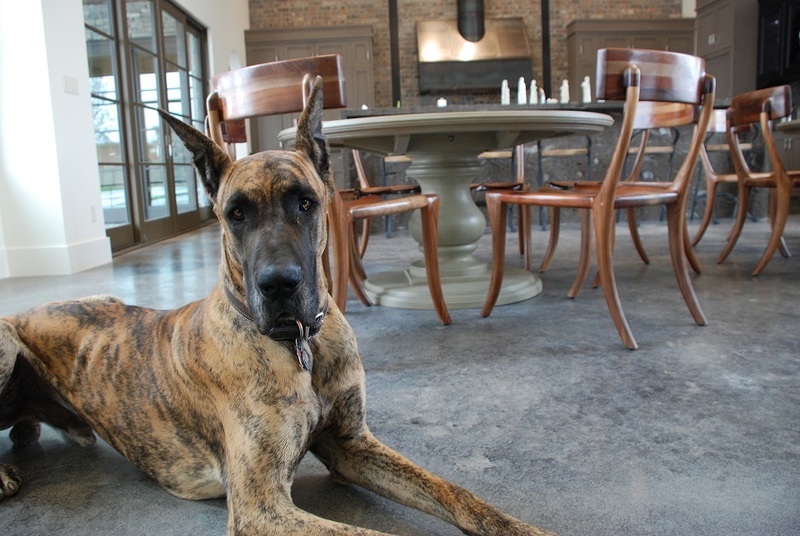 This is their great dane Solomon, looking so handsome with the chairs behind him. I just had to include this photo. Our last big order of the year was a bedroom ensemble that went to Breckenridge CO. Breckenridge is our favorite CO town with all its quaintness and beauty. 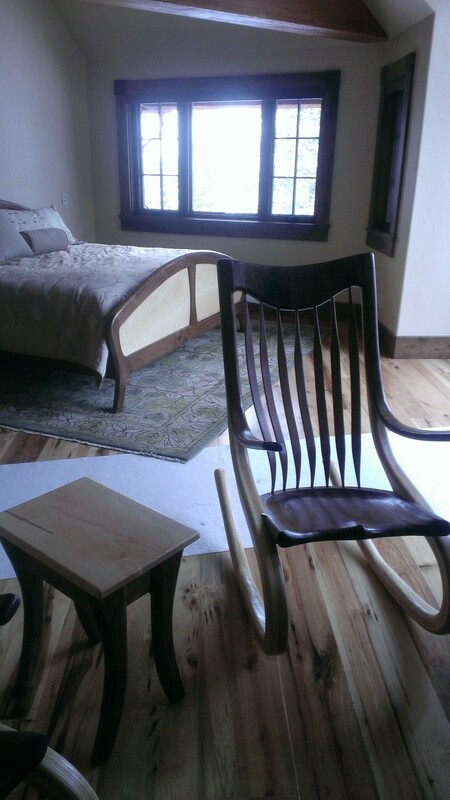 The ensemble consisted of a king size bed with night stands, two bent wood rockers with an end table, a low back chair and to be delivered in the spring is a custom desk. Everything was a combination of black walnut and tiger maple. It was such a striking combo and sure to be a stand out in this mountain home. Even though we had our challenges while working on this order, between getting sick and the very cold weather slowing us down, it went out the door last week and made it to CO in time for their Christmas family gathering. 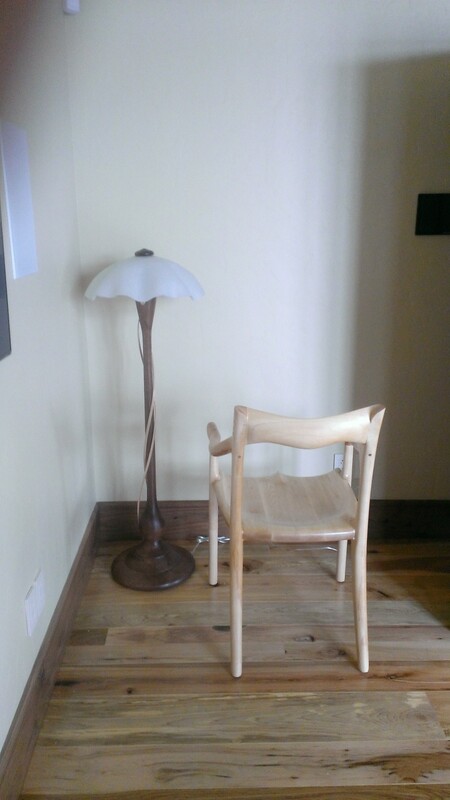 Here are some pictures that the designer, Cindy Gray of Interiors by Design in Breckenridge sent us. 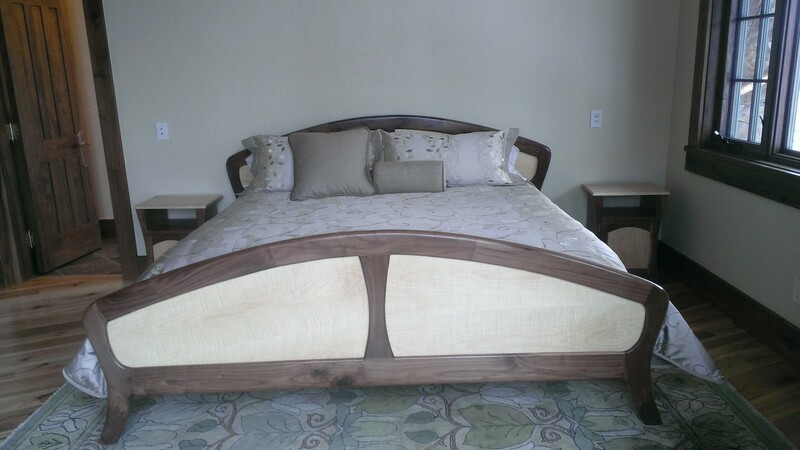 This is the King Size bed out of black walnut with the tiger maple on the inset. The two nightstands are on either side of the bed out of the same wood. 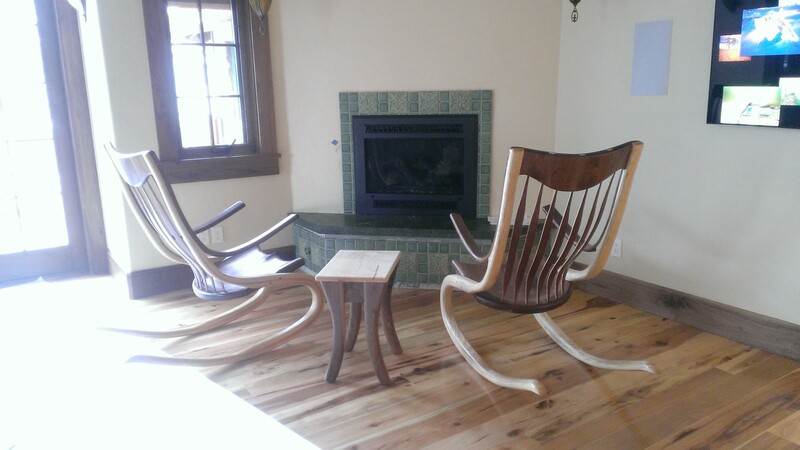 The two bent wood rockers and the little end table sit facing the fireplace. Such a cozy setting. This is where the desk will go with the low back chair. Now we can get down to getting ready to leave for three months in AZ to exhibit at Celebration of Fine Art. There is lots to do in such a short amount of time. But we’re looking forward to going, seeing old friends and customers and being in a warm climate. We’ll see how our two baby boys do out of their home setting. They should make lots of new two and four legged friends. The show starts on January 11th and goes till March 23rd. We plan to have many outstanding furniture and sculpture pieces at the show; along with creating many new sculpture pieces while we’re there. So if you can make it to the show, stop by and say hi and see what we have available. I will also be posting on our blog and facebook throughout the show, if you want to keep up on what we’re creating. It’s been a busy fall here for us here in the land of Shangrila. 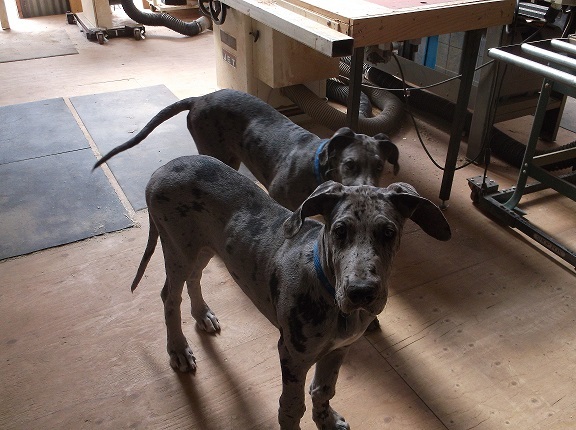 Our two new little boys, Apollo and Perseus (pictured below checking out the shop) are growing like weeds (up to about 80 & 90lbs at just over 5 months old). They are keeping us very busy and entertained. But we’ve also been busy with customer orders, making a delivery to Mystique Gallery in Scottsdale and now getting ready for another 10 week adventure in AZ at Celebration of Fine Art. 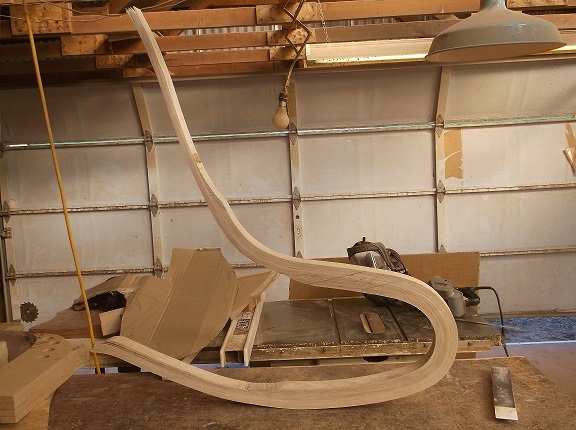 We just finished up a desk chair for a NM customer and are underway on a large bedroom order going to a new home in Breckenridge CO. 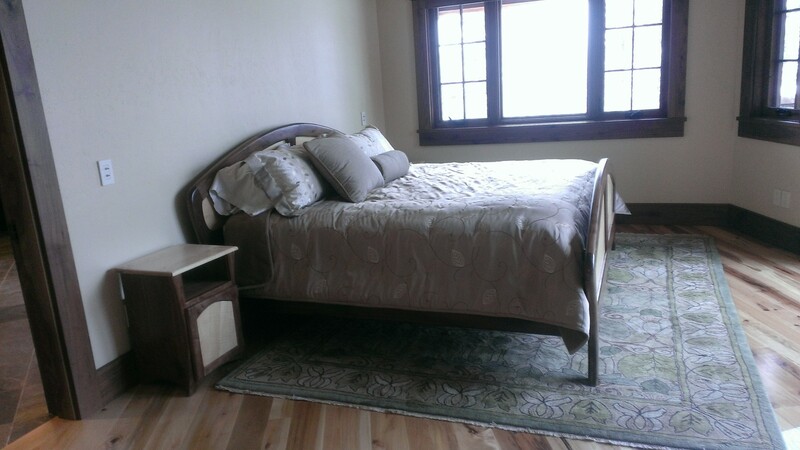 This large order not only has a king size bed with night stands, but a desk and low back chair and two bent wood rockers. 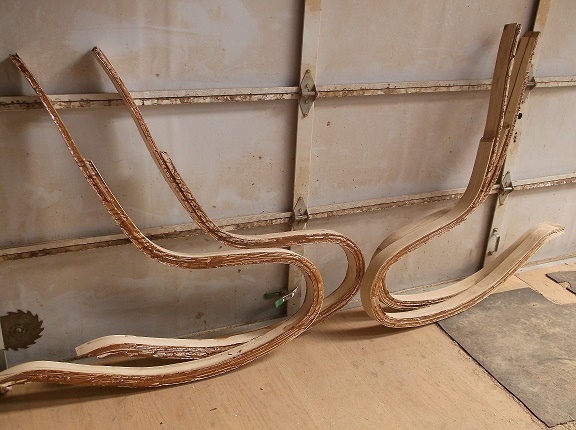 The bending involved in making one of these unique rockers is quite a task. In this blog I will show some of the steps in the creative process. Apollo and Perseus at 4 months old, checking out the shop. They love to see what’s going on and pick up pieces of wood to chew on. The first process is prepping for all the gluing of the legs. This process has to take place before it gets to cold. So we were in a crunch to get all the major gluing done before winter hits. Luckily our weather has been gorgeous and not to cold, which is unusual for this time of year. Scott also changed how the glue up goes on the legs, making each leg of the rocker, three separate glue ups. This may take more time, but makes it a little easier and a much stronger bend. 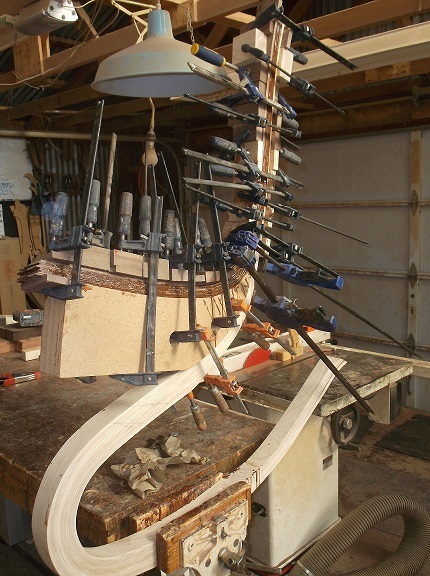 Once the three bends are complete, the arm gets glued up on a separate form that lies on the leg. 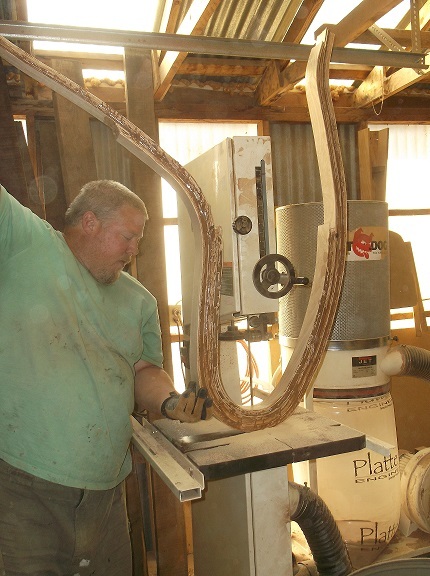 Normally we use contrasting woods, to really show off the whole process. 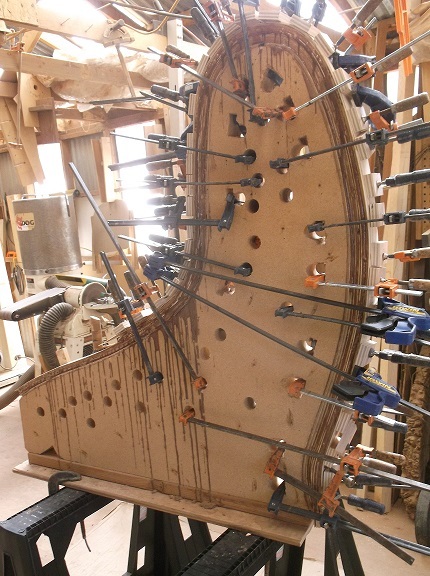 The seat and headrest (normally the same wood as the arms) are glued up, carved and shaped and then the process of putting the rocker together and shaping it, takes place. 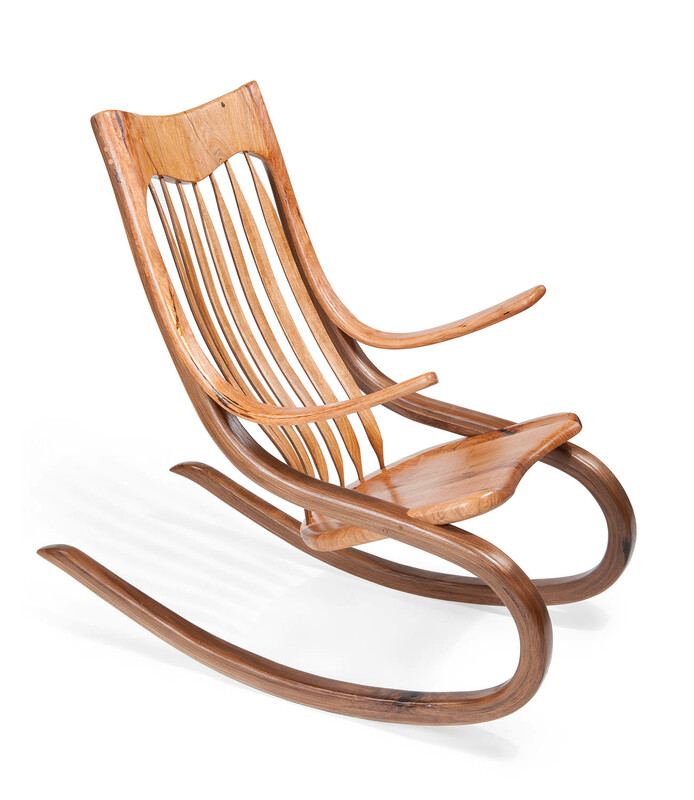 Even though the bending process of this rocker is very time-consuming and hard, the unique design makes this rocker like no other out there. It’s not the typical classic look, but has a more modern design. 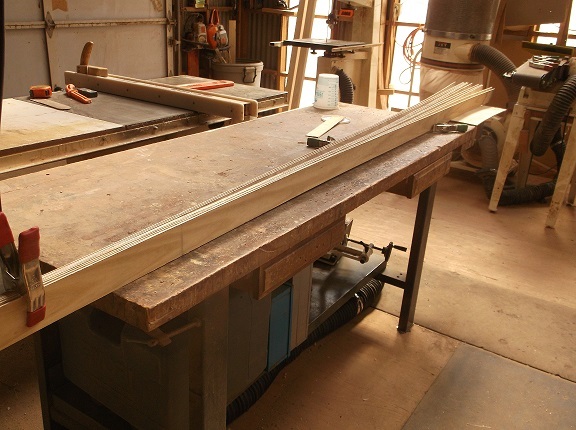 This is a set of 9ft long strips ready for the first glue up. Laminated strips glued up on the form. 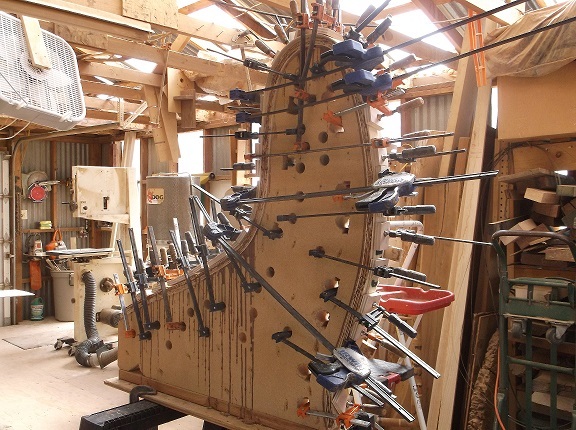 A lot of clamps go into this glue up. It takes both of us almost hour to do the glue up. This is what the first glue up looks like when taken out of the form. Here is the second glue up. This glue up is a little shorter than the first, building up the middle section of the leg, to make it stronger. 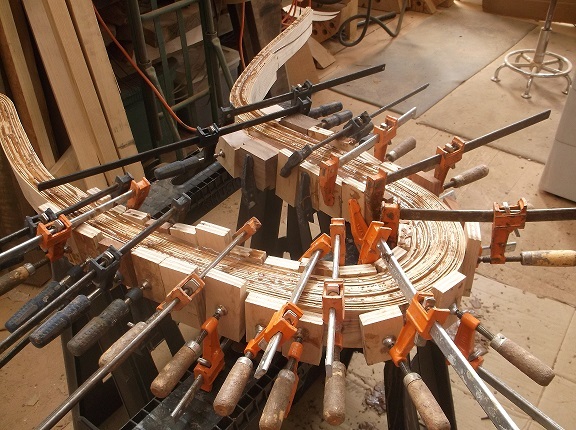 Now four rocker legs are glued up and ready for the 3rd and final glue up to beef up the curve area. 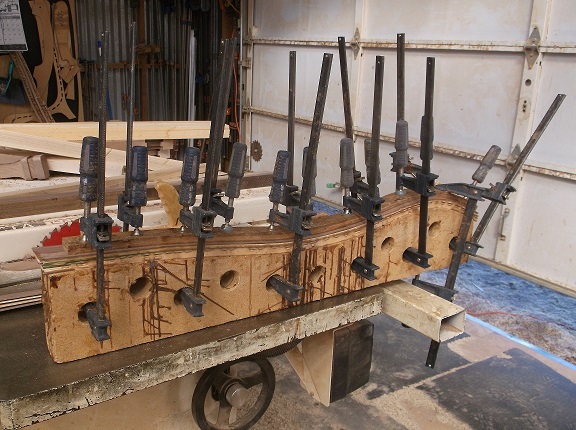 This is the last of the glue ups on the legs. 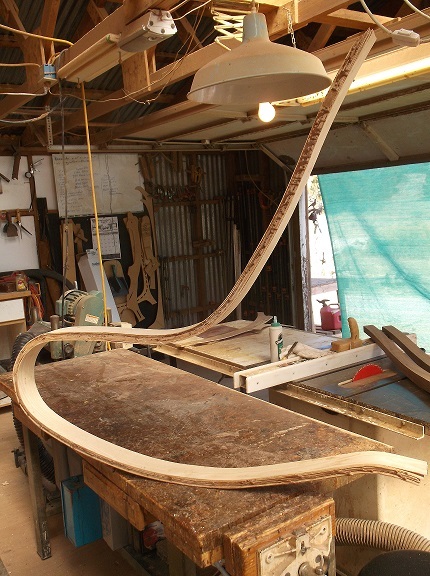 A small section of laminations is glued on to the curve to make it stronger. 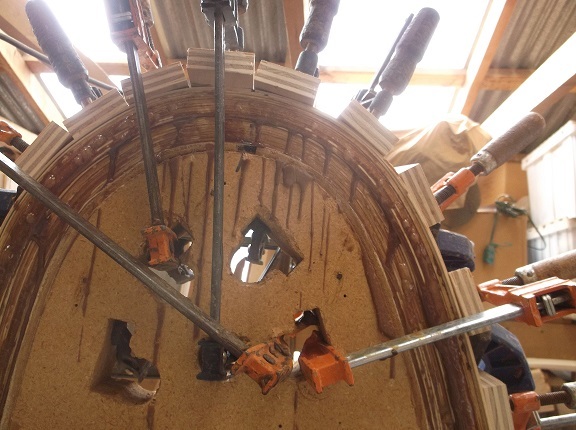 While some of the legs are being glued up, the laminations for the backrest are cut. Here we have walnut with ash in the middle. 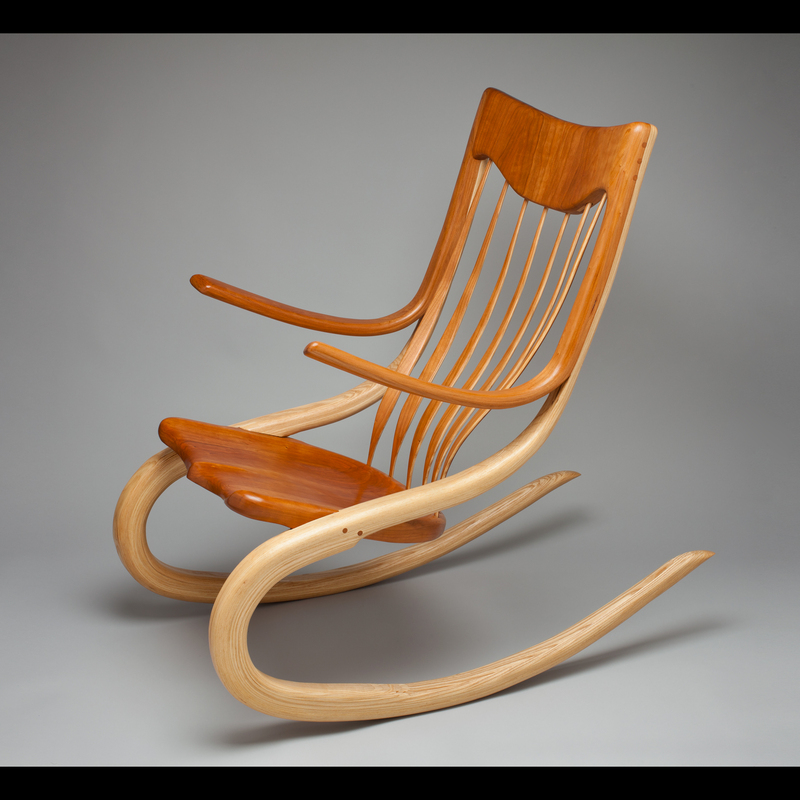 The contrasting woods blend in with the rest of the rocker and the ash in the middle of each backrest make them even stronger. These will be flexible backrests, that will flex as you rock. 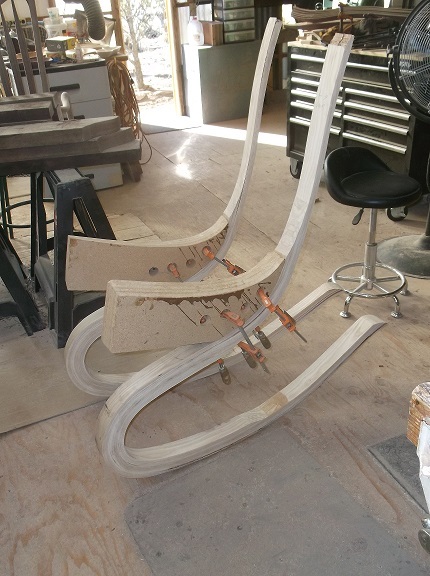 Here is two backrests being glued up on the form. This form was especially made to fit the curve of the back. 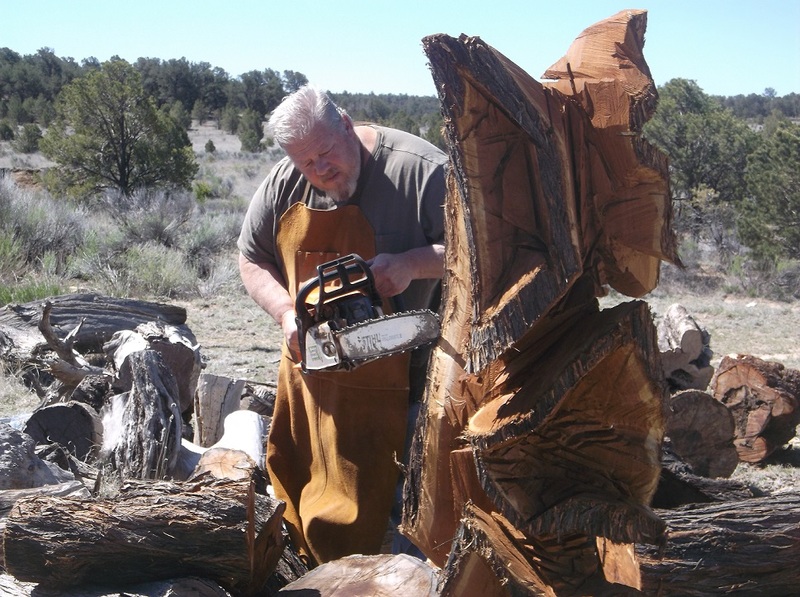 Here is Scott trimming up the sides of the rocker leg. 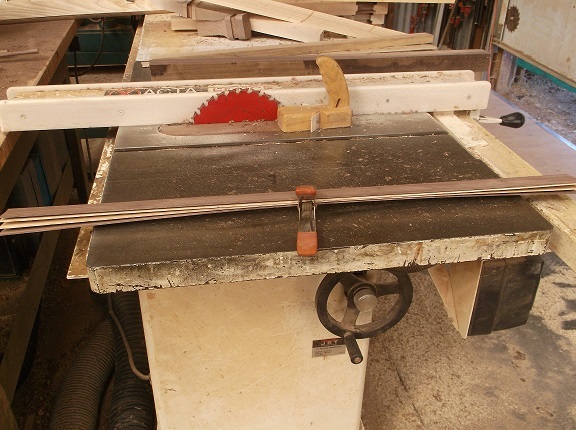 It is quite a cut on the bandsaw. This is what the rocker leg looks like with all the bends glued on and sanded flat. Now it’s ready to attach the arm. This is the arm form clamped on to the runner. This form is specially made to get a nice comfortable sweep while rocking. The arm is now glued on to one of the legs. 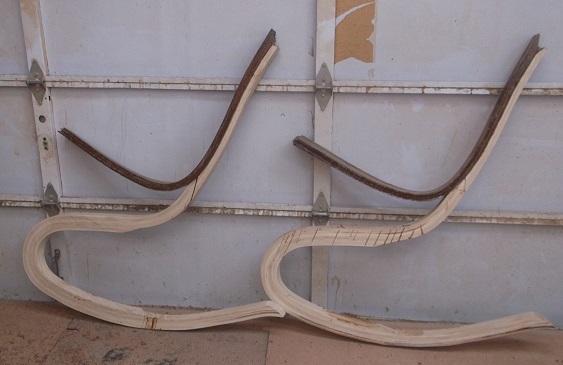 It’s a tricky glue up due to the curve and takes about an hour from start to finish. 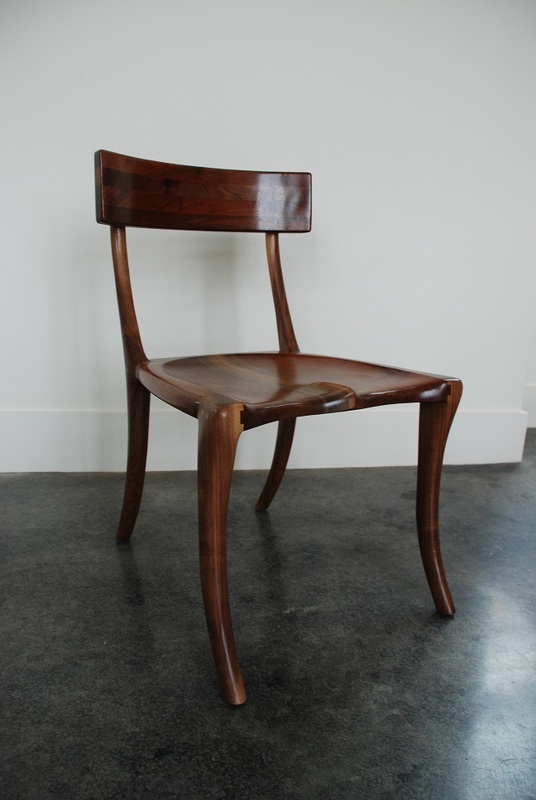 Here you can really see the contrast in the woods, with the walnut arms glued on for one rocker. Next the seat gets attached, then the headrest and back spindles. And finally all the sanding and finishing. 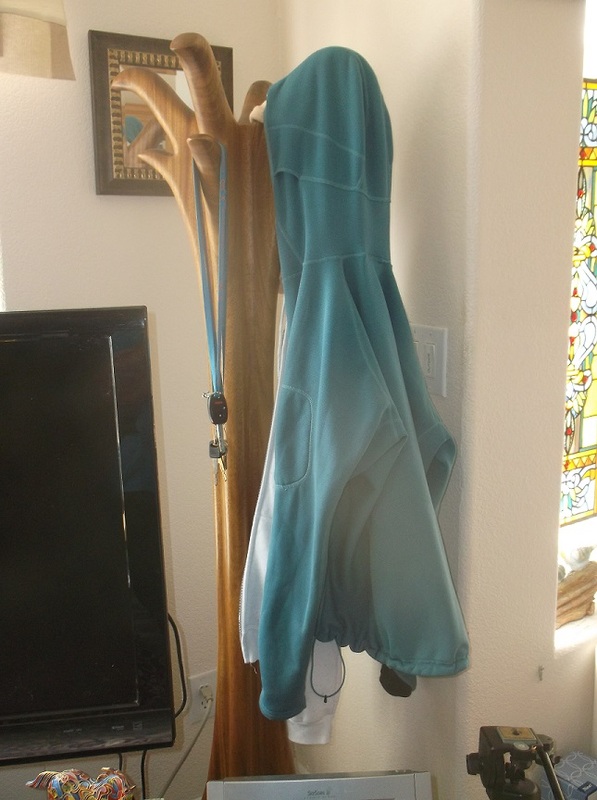 Stay tuned for the next blog, showing the completed rockers made from walnut and ash, along with the other bedroom furniture. 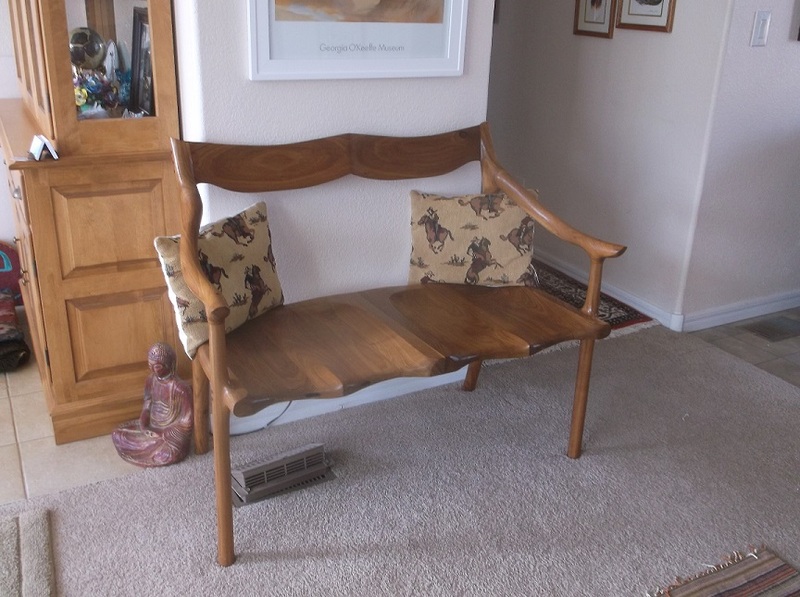 This was our first bent wood rocker made from walnut and mesquite. One of the places that was on our bucket list was Oregon, and we finally got to make a trip there recently. With the passing of our beloved Sampson, we needed to escape home and the void he left. So instead of shipping a bubinga rocker to Primary Elements Gallery in Cannon Beach, we made a last-minute decision to deliver it ourselves, along with a few carved vessels and bowls. The drive was long and we pushed it in two days and arrived in Astoria at our hotel, on the river late at night. The drive was a little boring and our mood was quiet. We’re both missing Sampson so much and he is always on our minds. But we were excited to see Oregon for the first time. They don’t call it a rainy state for nothing. It started raining almost the minute we drove into the state, continued the three days we were there and most of the drive out of the state. It was quite foggy upon arrival and made it hard to see. 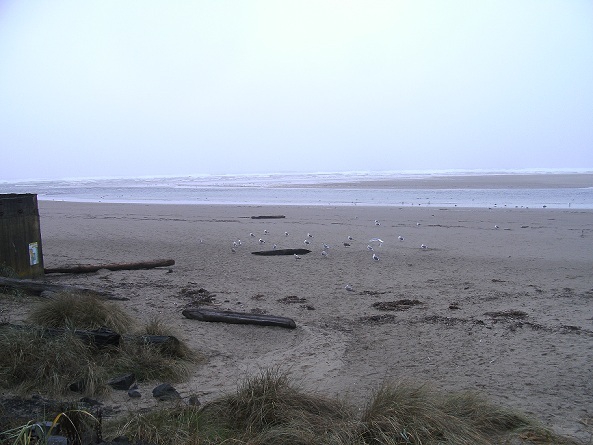 The Columbus river was quite spectacular with its grand size, dividing Oregon and Washington states and running almost the entire length of Oregon till it hit the ocean. There were several large barges running up and down the river. 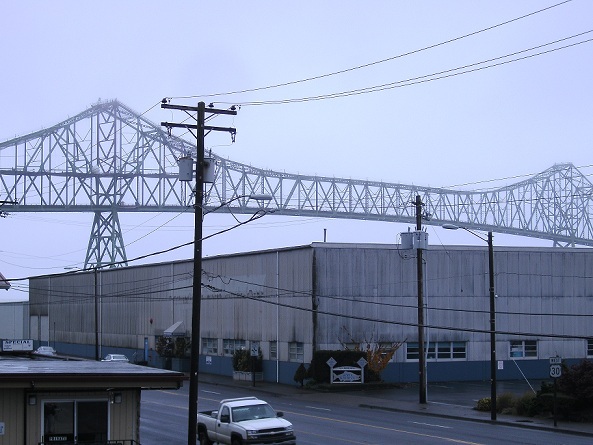 Our room in Astoria had a view of the river and the large bridges that run over to Washington state and to the rest of the Oregon coast. 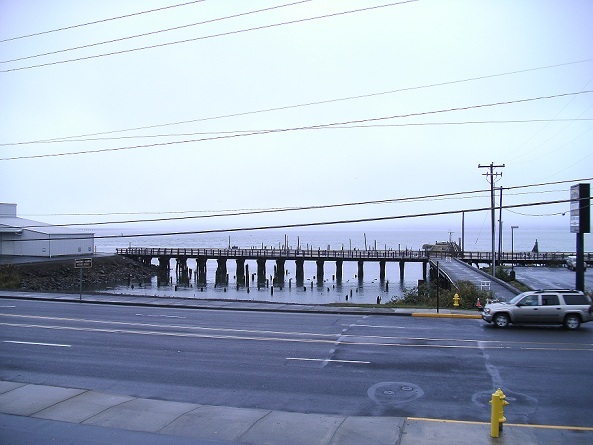 Our first day there, we looked around Astoria and had to admit it wasn’t what we expected. I had always wanted to go there (being a fan of the movie “Goonies” and “Kindergarten Cop”) and I guess I had a different vision of what it would look like. We toured a few things, including the Oregon Film Museum that concentrates on the “Goonies” movie and it was a huge disappointment. We did have a nice lunch on the river at a fancy restaurant and watched some ships come and go, along with a few sea lions swimming by. 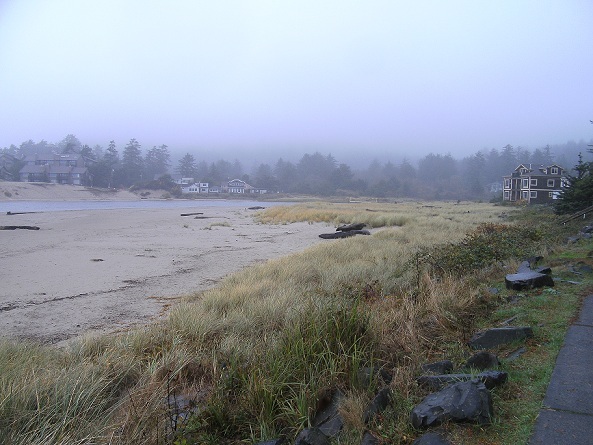 That same day we went to the historic Fort Stevens, which was thick with trees and was where the river and the ocean met. It was quite pretty, but the ocean always is. We drooled over the washed up logs and contemplated on how to get some home. But you must have special permits and a way to load them. Maybe next time. They definitely get a lot of rain up there. Everything was covered with moss. The trees were loaded with it, even homes and rv’s. The rain and fog gave an eery feel to everything. Overall, we enjoyed our trip and look forward to going back and seeing more of Oregon. 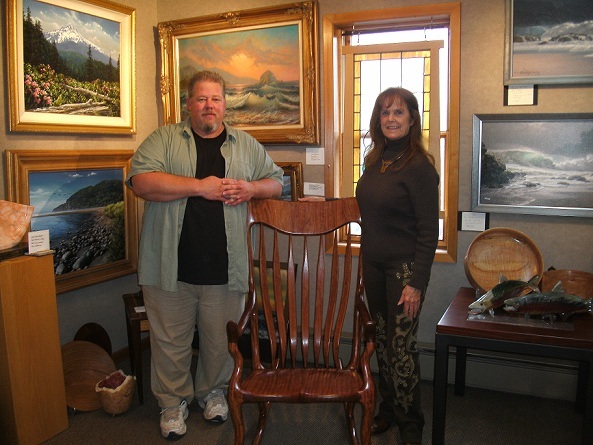 Our second day was making the delivery of the rocker to the gallery in Cannon Beach. This was a cute little town and everything we had expected to see in this area. We wish we had chosen to stay here instead. Maybe next time. There were several galleries and shops in the downtown area with quite a few shoppers for a rainy day. We made the delivery and chatted with the owner of the gallery, Stephanie for a while. Yes we share the same first name. She is a vibrant, energetic, friendly lady and seems to love what she does. Her gallery had an array of different artwork, along with a nice selection of wood art. While we were there placing out our pieces, we chatted with a couple and they ended up buying one of our carved mesquite bowls. That was a nice start to what we hope to be a long relationship with Primary Elements and the owner Stephanie. The rest of the day, we looked around the town and some of the sights. Our final day encompassed yet more rain and fog. We toured the Seaside Aquarium and had fun feeding the sea lions on exhibit. They were quite entertaining and we enjoyed the aquarium. By then though we were so sick of being wet and not being able to see much, we headed back to our hotel and relaxed for the next days drive. We wish we had planned better to leave a little earlier and head south to the Redwoods. I believe we would have enjoyed that so much and driving along the coast would have been beautiful. So next time we’ll have to incorporate that in. 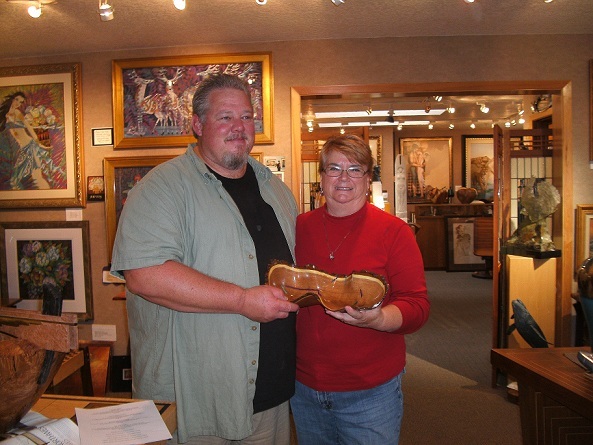 We hope the gallery does good with our pieces and that we can make another trip up next year. Now that we are home, we’ve been working on finishing up orders. We are making a trip to TX to make four deliveries and pick up mesquite logs from our friend and fellow woodworker Buddy Compton. Then it’s back home to work on a few more orders and what we will bring to the Celebration of Fine Art in AZ. This will be our first year at this 10 week show. Celebration is the original 10 week show, being around for 23 yrs, and it is an honor to be juried into this show. It is quite hard to get into and they have a big waiting list. We hope Celebration will be a big show for us and that we can continue going back each year. We will miss some of our friends that will be at the other 10 week show, but luckily we can see them here and there and catch up. 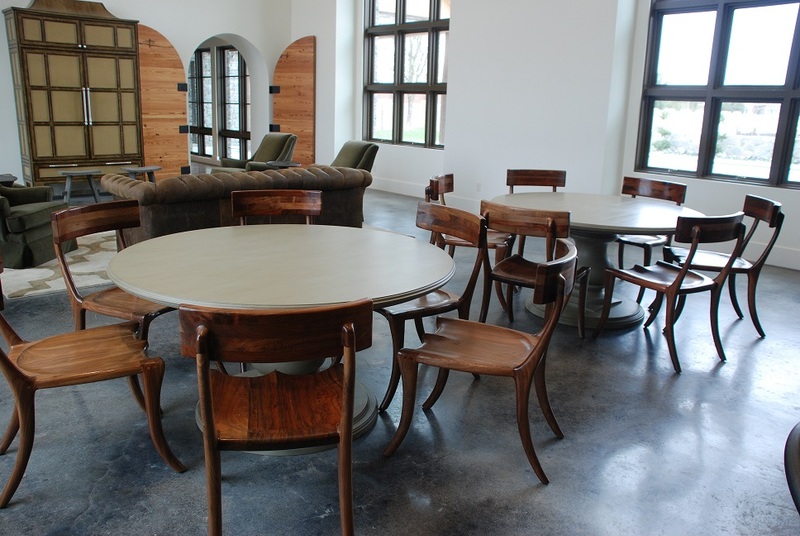 We have a nice booth that looks out over the sculpture garden and an outdoor work area out on its own. Since we are messy and noisy we will be put in a different area, but just down from our booth. We leave home on January 4th and the show starts on January 12th and runs through March 24th. Scott and I will be there everyday working for the 10 weeks, so we hope to be able to replenish what we sale and make more for the shows after this one. The weather will be so nice and we wish we could leave now. I’m looking at lots of snow outside, with a night of minus temps ahead and dreaming of the warm weather in Scottsdale. Next year should be an interesting one for us. We are going to load up on a few more shows and travel to some places we have wanted to go see. So we plan to be busy and hopefully have some fun as well. Family and friends that know us well, know how much Sampson meant to Scott and I. Our world evolved around this beautiful giant baby and we miss him so. 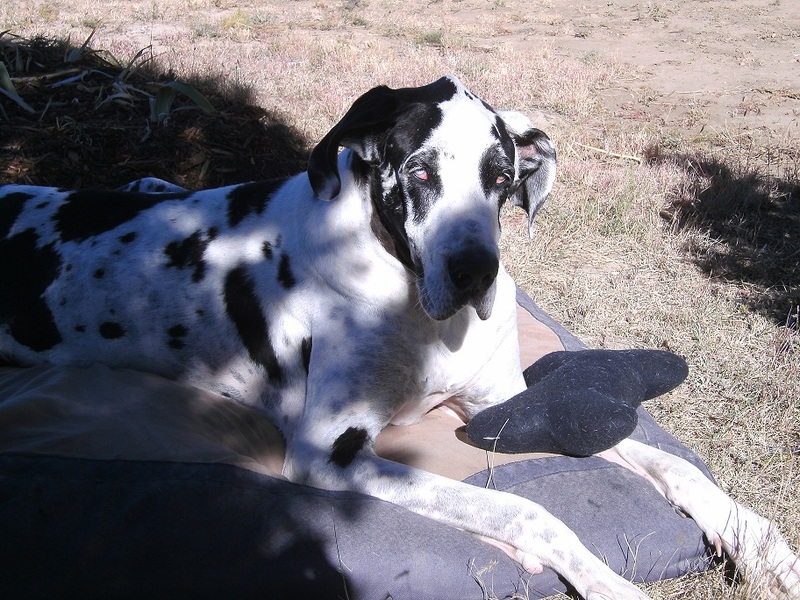 Our lives have been quite lonely with him gone and it will take a long time for us to heal from this loss. Here are a couple of the last pictures we took of him. We will meet again at “Rainbow Bridge” someday in the future. Laying on his favorite blanky among all his many squeaky toys. 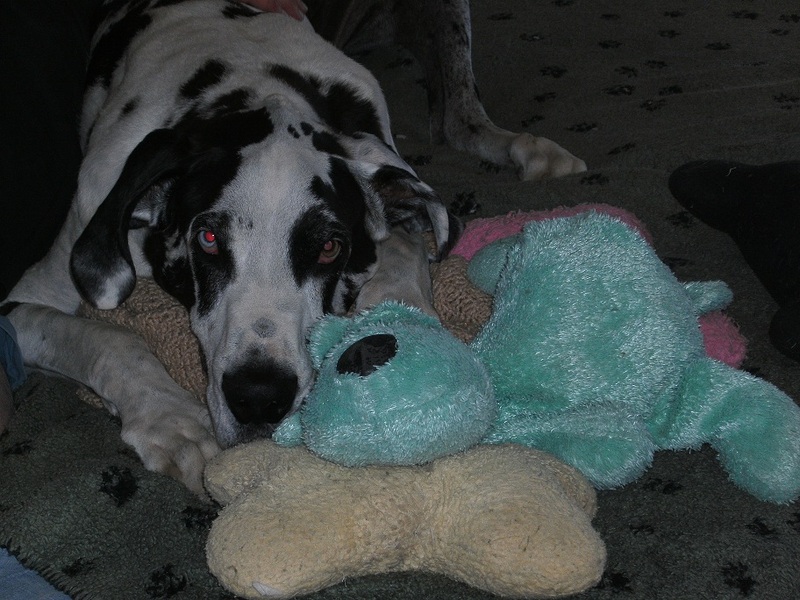 That dog loved his squeakies. What a sweat face. 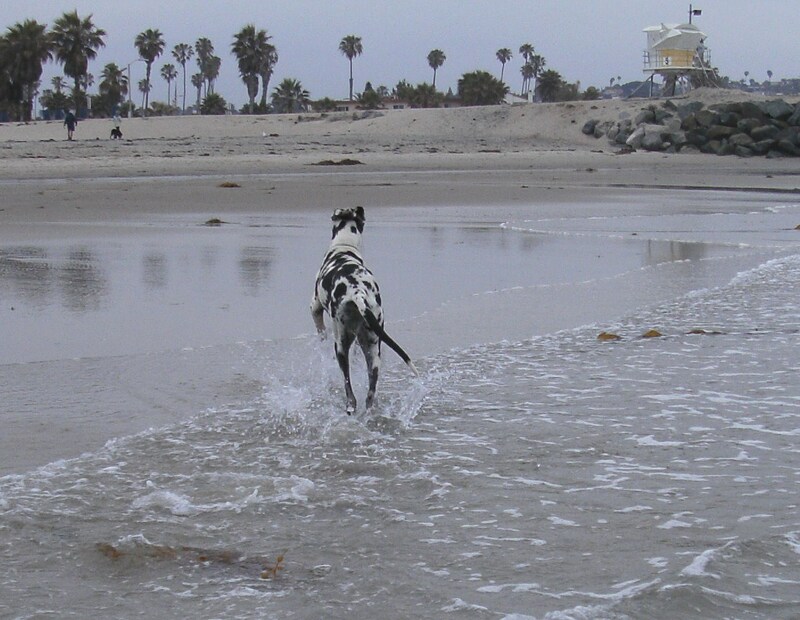 My favorite photo of Sampson from a few years ago on a trip to Dog Beach in San Diego, CA. We all had so much fun.